lower right: A. J. H. Way. [Still lifes of edible subjects from the collection of William H. Gerdts, on occasion of publication of cookbook by William and Lois Katzenbach], Board Room, American Federation of the Arts, New York, c. 1965, no catalogue, label no. 7. Mid-Nineteenth Century American Painting from the Collections of Henry M. Fuller and William H. Gerdts, Cummer Gallery of Art, Jacksonville, 1966, no. 50, repro., as Grapes. American Cornucopia: 19th Century Still Lifes and Studies, The Hunt Institute for Botanical Documentation, Carnegie-Mellon University, Pittsburgh, 1976, no. 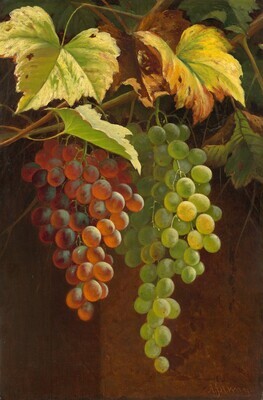 27, repro., as Still Life of Hanging Grapes. Gerdts, William H., and Russell Burke. American Still-Life Painting. New York, 1971: 72-73, pl. X.